What can you do after a great evil event? Show solidarity and put something in your window. Write a letter of kindness to someone who lives near the target. Be loving to your family, despite your anger and fear. Participate in art – paint, draw, write, sing. Exercise because moving is good for your soul, not just your body. After the Pulse gay nightclub shooting in Orlando, I didn’t follow it all. I didn’t exercise and I yelled at my family today. But the rest, I did. Monday I sent a card to the Orange County Medical Examiner’s office. The first responders and the police are treated as heroes, but the coroners have a grisly job that we don’t often want to think about. They need our prayers also. I adapted an eloquent prayer from Laurie Kraus to use at the Prayer Vigil Sunday evening. I needed to do something else with my anger and grief, so I did some quilting. 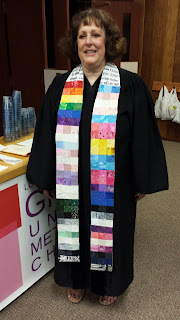 I made a stole with a variety of pride flag colors. At the base, I put a quote from Jesus: “Love one another,” John 13:34. Last week, a beloved church member asked me if I wanted two picture books: AIDS; You Can’t Catch It Holding Hands, 1987, and The Christmas Menorahs, 1995. She had been an AIDS educator in the 1980’s and has lived in Billings for years. She knew I would love these books. I do. It was a coincidence that she gave me these books on June 12. The Christmas Menorahs reminded me of how Not In Our Town got started. In 1995, hate groups in Billings targeted Native Americans and African Americans, and threw a rock through a Jewish family’s Hanukkah-decorated window. Afterwards 10,000 homes in Billings put menorahs in their windows. So Monday I put a Gay Pride rainbow flag on my window. Imagine what it would mean to our LGBTQ siblings if every window in town had a rainbow flag in it. Also on Monday, I got cleaned up and dressed in my robe and stole for a television interview with two other prayer vigil leaders. For the first time, I felt confident in front of a tv camera. I spoke clearly and with passion. The other two told me I was great. Yet, that night, on the news, my part was completely cut out of the interview. The reporter did tell people that I urged them to put a rainbow flag in their window. When hate crimes happen, those in the targeted groups feel vulnerable. Since the shooting, I have provided pastoral care to people inside and outside my church. LGBTQ people are afraid; allies are angry. When we are afraid and angry, we have to work doubly hard to show love. Saturday I performed a wedding, where my homily was all about demonstrating love by being kind, listening, and spending time with one another. That’s what love takes. May you feel enveloped by God's love in the weeks to come.